Today's modern hard drives access information on disks fast by spinning the disk at an amazing 7,200 rpm (revolutions per minute). By default, Windows xp is configured to spin down the hard drive after a short period of inactivity. Unfortunately, the person who designed this feature must have nodded off during physics class. Because of modern low-friction bearings and lubricants, once you get the disk spinning up to speed, it takes very little energy to keep it spinning. In physics that principle is called "Conservation of Angular Momentum". However, after you turn the disk off and let it spin down, it requires quite a bit of energy to rapidly bring it back up to 7,200 rpm. Imagine a scenario where disk turn off is set to a bit shorter time than what you take for break several times each day. If, after you let the disk spin down, you decide to use an application on that computer, you'll need to wait for the disk to come up to speed again. Turning off the hard disk not only wastes power (except perhaps if you leave the system on overnight), but it also gives you a performance hit. Fortunately it's very easy to disable hard disk turn off. Select Start | Settings | Control Panel | Power Options. 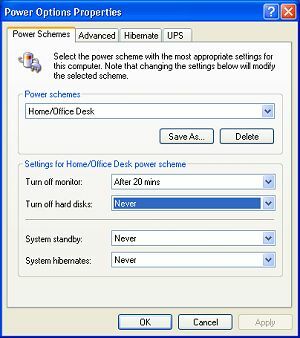 In the Power Options Properties dialog box that appears, on the Power Schemes tab, in the "Power Schemes" drop-down list, select the proper scheme. Then in the settings for that scheme, in the "Turn off hard disks:" drop-down list select "Never". Then click on the [Apply] and [OK] buttons. Conserve energy, improve Windows XP performance, and make your physics professor proud by disabling Hard Disk Turn Off.